Everyone familiar with my work knows that I have a very strong anti-censorship policy. I allow everyone to have their say on the Another Angry Voice Facebook page, and very rarely resort to deleting things. 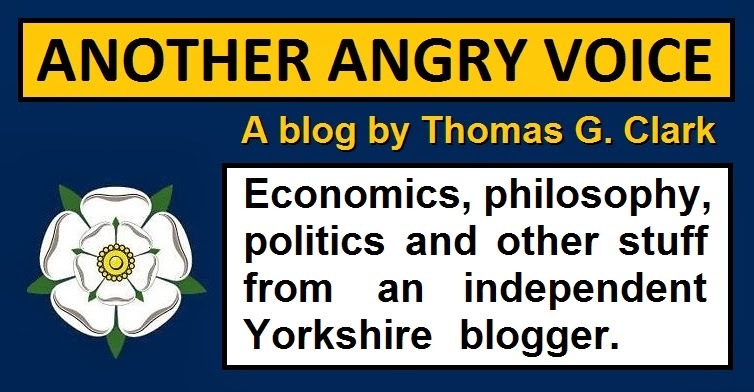 The reason I allow everyone to have their say, even though I might strongly disagree with them, is that I don't want Another Angry Voice to become a closed ideology echo-chamber like so many other political pages on Facebook. In my view it is a far better strategy to engage in debate and win the argument, than it is to simply delete disagreeable comments and ban anyone who dares offer differing opinions (as UKIP, other political parties and numerous high profile politicians routinely do on their social media pages). On the extremely rare occasions that I do decide to delete things or ban people from my page*, I inform the community of what I've done and explain exactly why I've done it. I keep everyone informed like this in order to maintain complete transparency. On the evening of 12 May 2014 I committed my first (and hopefully only) act of mass censorship by removing an image from my feed which had been liked, shared and commented on by well over 10,000 people. I took the decision to remove it after having received legalistic threats from a UKIP candidate. The image I removed was the anchor for thousands of conversations which have now been destroyed. It is rather ironic that a large percentage of the comments that were deleted as a consequence of this UKIP demand were actually sympathetic towards UKIP. Unlike the vast majority of images I share on my page, the image I removed was one I had borrowed from elsewhere, rather than one I'd designed myself. It was used to illustrate a comment about the widely reported story of how a UKIP candidate had set the police on one of their political opponents in order to intimidate him into removing some perfectly legal posts from Twitter, even though the police had absolutely no legal right to ask him to do so. The precise nature of the complaint made against me was that I had infringed UKIP's copyright because the picture I had shared included their logo. The UKIP candidate stated that he had reported my page to Facebook and that he had brought my page to the attention of UKIP head office. In my view it's highly ironic that another UKIP politician has now come along to make legalistic threats towards me in order to get me to remove my post highlighting the other UKIP politician's attempts to stifle the freedom of speech of another one of their political opponents. It feels like an act of meta-censorship to rival any celebrity super-injunction imposed in the UK libel courts. Many people have expressed their disappointment that I "caved in", but in my defence I have worked tirelessly for over three years to get to the point where I can reach out to literally millions of people per week with my work, and I simply can't face the possibility of losing this power to speak out and be heard if my page is shut down over some stupid spat with UKIP over a single image that I didn't even design myself. 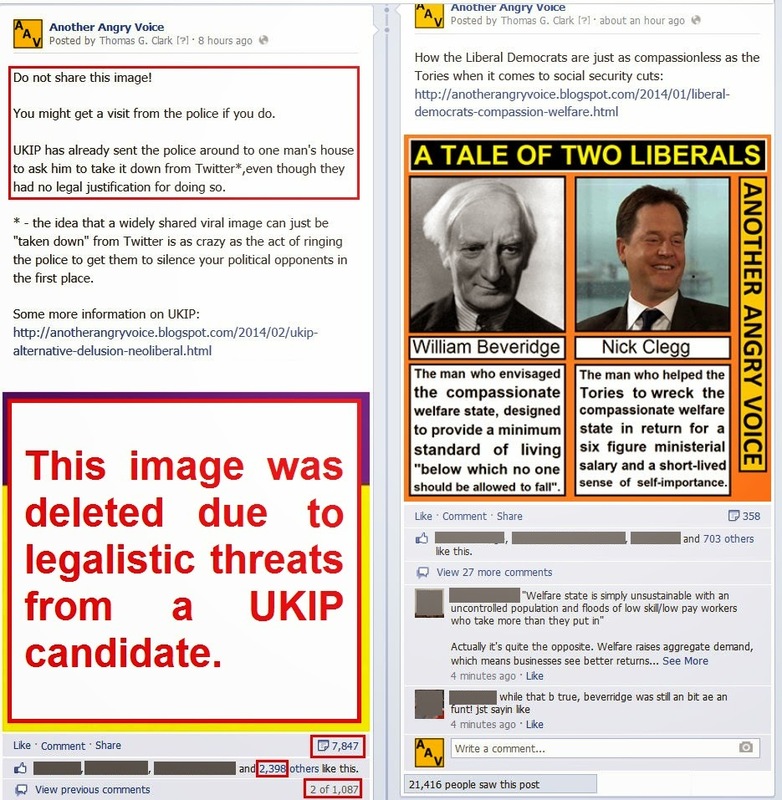 Even though it is absolutely clear that UKIP would have been laughed out of court had they attempted to use the legal process to force me into this act of censorship, I still decided to go ahead and delete the image because any decisions made over this case wouldn't have been made in a British court of law, they would have been made unilaterally and arbitrarily by Facebook. The reality of the situation is that Facebook don't need the approval of a British judge and/or jury in order to shut down my page, they can pretty much do whatever they like on their own website (check their terms and conditions). One of the main factors that helped make my decision to remove the image is the fact that both the image and the censorship story I was using it to highlight are all over social media. Using legalistic threats in order to get one statement about their attempts to curtail free speech taken down, doesn't men that the criticism will go away, in fact it's more than likely to increase the number of people using social media to talk about the way UKIP use threats in order to stifle criticism of their party. It is worth noting that none of the other political parties I've criticised have ever attempted to curtail my freedom of speech by demanding that I remove images about their parties, countless of which contain versions of their political logos. This is despite the fact that I've produced and shared far more pictures criticising the Tories, Labour and the Liberal Democrats than I ever have about UKIP. Please don't take this observation as any kind of endorsement of the Westminster establishment parties, I'm very clear about the fact that I strongly oppose all of the parties that subscribe to the neoliberal ideology, and suggest that people seriously consider voting alternative in the Euro elections. I have decided not to name the UKIP candidate because I don't want to allow the remotest possibility of a personal witch hunt against this person. I'd rather any anger at this effort to curtail my freedom of speech was aimed at the UKIP leadership for having allowed their candidates to go around attempting to silence their political opponents. After the appalling negative publicity generated as a result of the police being called in to intimidate one of their political opponents just a few days previously, one would have expected any sensible political party to take measures to prevent any kind of repeat performance. Clearly the UKIP leadership failed in this regard, which reflects as badly on the internal organisation of their party as it does on their attitude towards protecting the freedom of speech of people they don't necessarily agree with. A screenshot of the Facebook post that has now been deleted. This incident will not prevent me from continuing to criticise UKIP. In fact it has made me even more certain that this extreme-right party represents a grave threat to what remains of our democracy and our freedoms after 35 long years of neoliberal ideology. If they're prepared to make threats like these to curtail our freedom of speech when they have no real political power, it's easy to assume that they would come up with something a lot more draconian than the (already deeply disturbing) Gagging Law, should the nightmare scenario happen and we end up with a Tory-UKIP coalition in 2015. In conclusion I'd like to apologise again for having censored so many conversations at the behest of UKIP. I feel extremely uneasy about what I've done, and I have found it difficult to read all of the messages chastising me as a coward for having given in to this kind of intimidation. I find myself hoping that having "caved in" like this won't have done too much damage to my reputation as a man who stands up for what he believes in. Another Angry Voice is a not-for-profit page which generates absolutely no revenue from advertising and accepts no money from corporate or political interests. The only source of revenue for Another Angry Voice is the PayPal donations box. If you could afford to make a donation to help keep this site going, it would be massively appreciated. * I've only ever banned 9 people (for doing stuff like calling for ethnic genocide against Arabs, repeatedly bullying other users, ignoring countless requests to stop spamming, and making extraordinarily slanderous accusations of paedophilia), which is very low considering I now have over 55,000 followers, and my content attracts well over 10,000 comments per week.